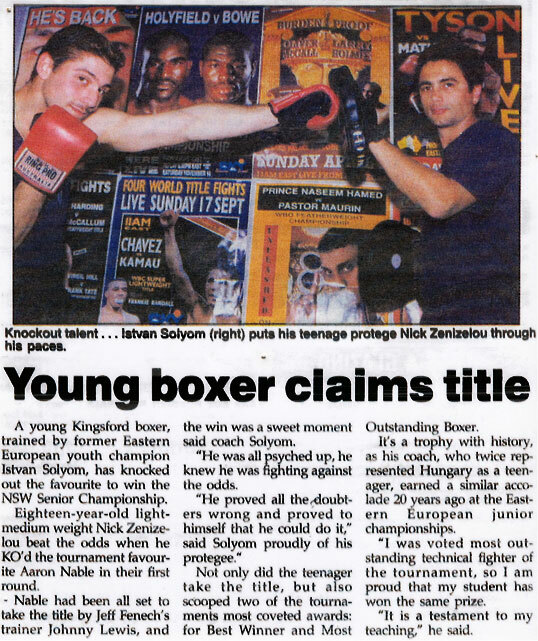 A young Kingsford boxer, trained by former Eastern European youth champion Istvan Solyom, has knocked out the favourite to win the NSW Senior Championship. Eighteen-year-old light-medium weight Nick Zenizelou beat the odds when he KO’d the tournament favourite Aaron Nable in their first round. 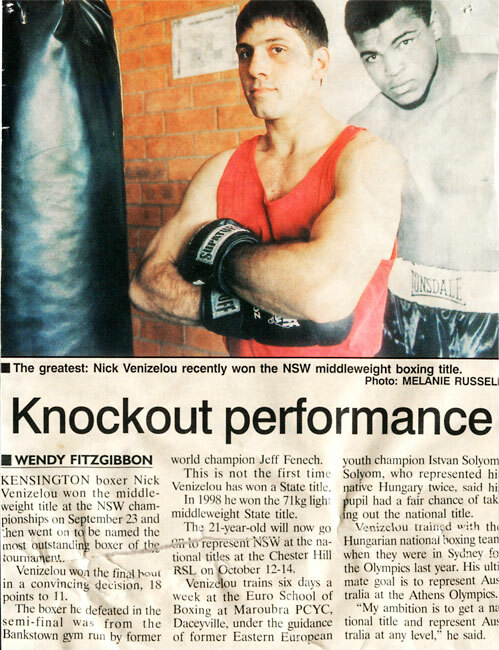 Kensington boxer Nick Venizelou won the middleweight title at the NSW championships on September 23 and then went on to be named the most outstanding boxer of the tournament. Venizelou won the final bout in a convincing decision, 18 points to 11. 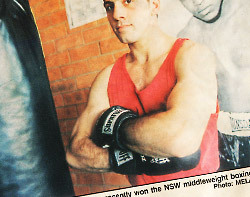 The boxer he defeated in the semi-final was from the Bankstown gym fun by former world champion Jeff Fenech. 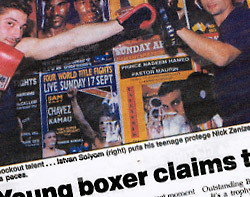 On December 14 the annual Police and Community Youth Club’s (PCYC) State Boxing Competition will be held at Umina PCYC. Maroubra PCYC will have three representatives in the competition. 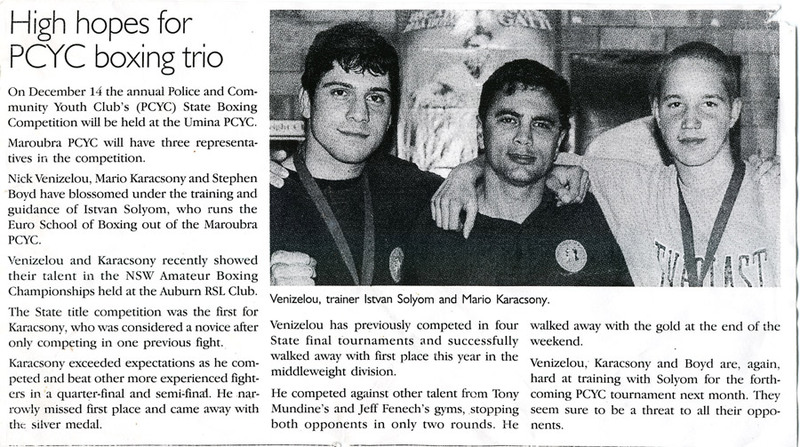 Nick Venizelou, Mario Karacsony and Stephen Boyd have blossomed under the training and guidance of Istvan Solyom, who runs the Euro School of Boxing out of the Maroubra PCYC. 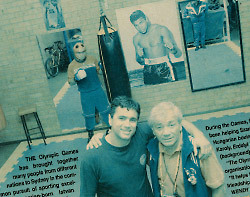 OLYMPICS SPECIAL REPORT - Southern Courier, September 26, 2000. The Olympic Games has brought together many people from different nations to Sydney in the common pursuit of sporting excellence. 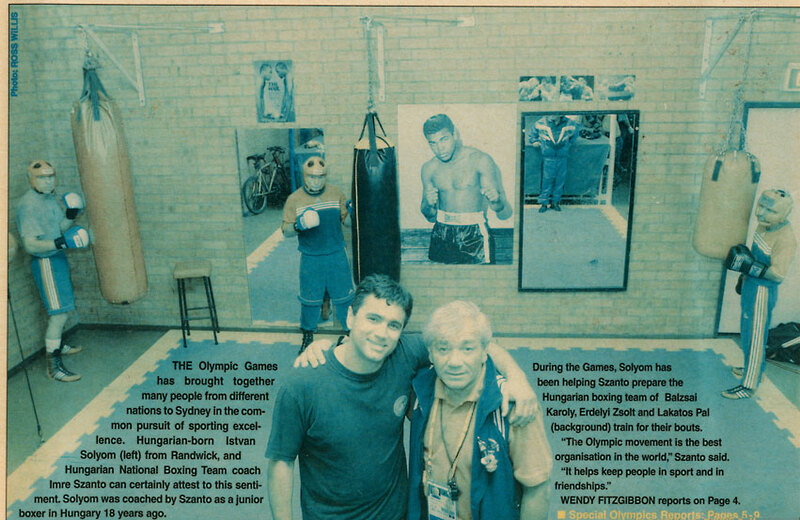 Hungarian-born Istvan Solyom (left) from Randwick, and Hungarian National Boxing Team coach Imre Szanto can certainly attest to this sentiment. 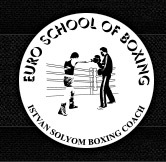 Solyom was coached by Szanto as a junior boxer in Hungary 18 years ago. 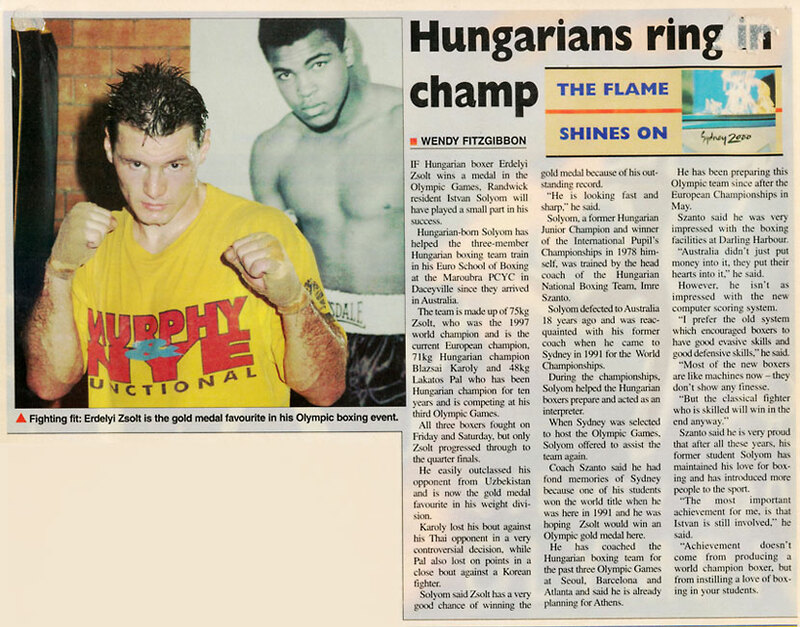 HUNGARIANS RING IN CHAMP - Southern Courier, September 26, 2000. 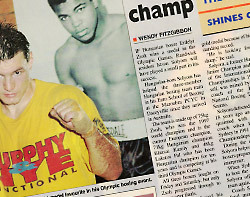 If Hungarian boxer Erdelyi Zsolt wins a medal in the Olympic Games, Randwick resident Istvan Solyom will have played a small part in his success. 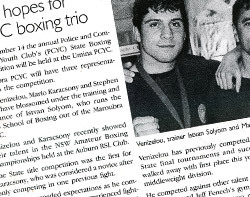 Hungarian-born Solyom has helped the three-member Hungarian boxing team train in his Euro School of Boxing at the Maroubra PCYC since they arrived in Australia. Strutting around the ring between rounds wearing as little as possible has been the longstanding role for women in boxing. 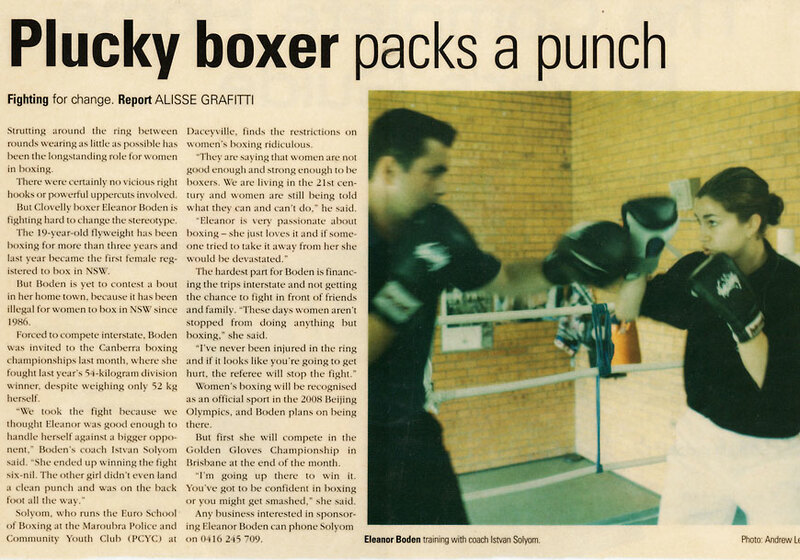 There were certainly no vicious right hooks of powerful uppercuts involved. 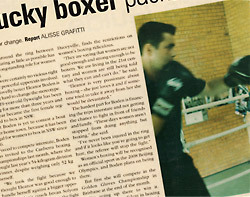 But Clovelly boxer Eleanor Boden is fighting hard to change the stereotype.